Of all the definitions of “friend,” I prefer the one that says friends are people we share our secrets with. The idea is that we grant greater access to closer friends. Sure, we break this rule, trusting a new love interest too soon or crying in McDonald’s, rambling to a stranger while barely touching our burger. But generally, we divulge our secrets as experience suggests someone will not betray our confidences. Familiarity breeds friendship. We bond over shared backgrounds, current passions, and private definitions. There is comfort in not having to explain what you mean. Ease when someone else “gets it.” This is why I don’t play spades with rookies – you lose games you should win because they have yet to learn the language. With someone who knows the game, however, gone is the partner who needlessly plays cards higher than yours. In their place is someone who communicates the strength of their hand with a glance. You work together more easily than you do with a novice because you both understand how the game works. Conversations between Black and White Americans often endure a lack of familiarity. All things considered, this is predictable. White Americans outnumber Black Americans 7 to 1. Thus, it is easier for Black Americans to be acquainted with White Americans than the reverse. Research also shows that we favor in-group members over out-group members. Whether the out-group is the kids from the next block or the sports team in another city, we tend to think the best of our group and the worst of others. This can cause us to treat people who are not members of our group worse than people who are members of our group. In the United States, states and localities enacted segregation laws from 1876 – 1965 to reprise pre-Civil War social divisions. In 1934, the Federal Housing Administration subsidized suburban housing loans on the condition that none of the homes be sold to African-Americans. Marketers sold entire cities to White Americans, appealing to a need for security by claiming they had no Black residents, falsely implying the cities were crime-free. People also self-segregate, choosing to live and associate with like-minded others. Additionally we watch television shows and visit websites that agree with our pre-existing beliefs. Today, we can go weeks without encountering a contrary viewpoint. Consequently, Americans tend to have friends who belong mostly to the same race. These factors result in a gulf of understanding, even where people share more similarities than differences. Schools could abate this knowledge gap via student investigations of historical subjects, graded on detail and nuance. Instead, history classes omit loads of information. Decades can pass before someone grasps the scope of the acts committed by and against our ancestors. Even then, our general understanding is “White people do a lot of bad things to Black people.” Daily news coverage reinforces this narrative, encouraging debate about the sensational rather than solely informing us about the significant but mundane. It’s usually after one of these stories sparks a national conversation that someone asks me what do you think of [insert current event here]? My brain starts its analysis. Who’s asking? Do I know them? If so, what’s their usual M.O.? If not, what does their inflection tell me? Are they asking my opinion, my opinion “as a black man,” “as a lawyer,” or someone else? Most often I’m aware of the event, but haven’t read beyond the headlines. I ask for more information. I receive facts, opinions, value statements, and speculation (not necessarily in that order). Zero point six eight seconds later my indifference disappoints my companion. I was. Twenty years ago. I weigh my options. Do I feel like having this conversation? How long is this going to take? Is this person likely to update their beliefs based on what I say? When’s lunch? I engage and explain: Africans and their American descendants are more than victims of history. Including their responses to events that happened around them and incidents that happened to them reveals a push and pull that is absent from the history we teach. Consider segregation again: The United States outlawed slavery. 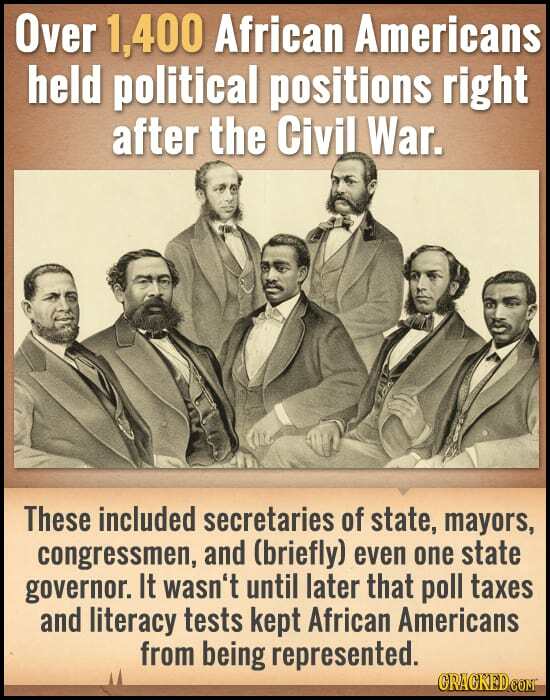 The former slaves ran for political office, including Congress, and won. In response, Southern legislatures enacted forced segregation and other laws intended to strip African-Americans of their ability to participate in the leadership of their states. African-American lawyers answered with a years-long strategy that ended segregation. Even in isolation, the history we haven’t learned refines perceptions. History classes often teach that Europeans kidnapped Africans from beaches. Based on this, we infer that millions of people were simply scooped off the beach and dropped into boats. Instead, the truth is that Africans controlled the sale of slaves to Europeans during most of the Trans-Atlantic slave trade. Africans valued labor and tended to have a lot of slaves. African slave traders were happy to sell, getting rich in the process. While Europeans definitely tricked some Africans onto boats, it was far easier (though more expensive) to purchase a slave from Africans. That is, until improvements in firearms shifted the balance of power from the African slave traders to the Europeans. When we consider the Trans-Atlantic slave trade, we usually focus on horrific events that produce strong emotional anchors: fear, anger, guilt, pity. But the innumerable unknown acts of our ancestors comfort me. Most never lost their drive for self-determination. Knowledge of these acts pulled me away from asking “why do they keep doing this to us?” long ago. Thus, when someone asks me to connect the past to a current event, I can’t get angry. Instead, I respond with pride. But what about [insert heart-wrenching moment here]? I ask for a second. A few Google searches later, I’m back. Usually, I learn that the event which led to this discussion, while tragic, doesn’t happen often. But deep down, I know statistics can’t compete with the amygdala. The possibility that something bad might happen once outweighs the certainty that it won’t happen 999,999 times. I try anyway and fail. I regroup. I point out that I answered the original question 10 minutes ago, but what started as an inquiry has become a debate. For my companion. Who is now committed to “winning.” In the meantime, I’m trying to decide whether to walk away. A wise old lady once told me that you can only fight facts, never opinions, and I recognize that the question of how angry I should be about a current event is a matter of opinion. Then again, I’m having fun. And I have a few more facts. And I might make a breakthrough. And my companion has just said something along the lines of but I bet the [poor Black citizens of the United States] don’t think that. This is why I don’t play spades with rookies. Unbeknownst to my companion, I’ve been holding a trump card the entire conversation – I grew up in the projects. I would have preferred to divulge this fact through the normal friend-building process. I even dropped a hint that my past was relevant to what we were talking about, but it’s too late. The statement warrants correction. I stop everything to clear up a few things: There isn’t a Black lens any of us can view the world through. Talk to enough people and you realize you’re looking through a kaleidoscope, watching temporary shifting patterns of opinion arising from the light of life and the colors of experience. You can’t see these patterns by talking to one person. After all, we divide over more than just race. Nevertheless, I represent my neighbors to help my companion handle the truth that there is often distance between what my neighbors think is important and what others believe is important for them. With that conversation finished, I finally ask what I’ve learned to ask at the beginning of these encounters: “why do you ask?” My companion’s reason is typically tangential to the original question and race is not the dominant factor they think it is. At best, their reasons are specific. In these cases, I relish the opportunity to shift my companion’s thinking so they can effectively achieve their goal. At worst, the reasons are vague, amorphous, and I find myself speaking to someone unwilling or unable to see past the blinders created by their preconceived notions about African-Americans. I’ve learned to let them be. And rarely, someone truly is intellectually curious, and wants to discuss these topics with me. Under the Articles of Confederation, each state had one representative and one vote in Congress. Congress chose the President. The amended, “more perfect union” created by the Constitution added in the House of Representatives and the Electoral College. The total free population and 3/5ths of the slave population residing in the state determined its representation in both entities. The questions of why this change happened, and how it affected the country is a story for another post. The 1923 U.S. Supreme Court, in U.S. v Thind, separated the scientific and popular definitions of the terms Aryan and Caucasian, deciding that Indians from the extreme northwestern part of the country were not white, despite being both Aryan and Caucasian. After the Civil War, the former slaves were granted the rights to vote and profit from their own labor. African-Americans were the majority population in Mississippi (and a significant minority in several other states), and thus voted the first African-Americans into Congress and other positions of power. To combat these developments, Southern legislatures passed laws that effectively stripped African-Americans of their right to vote (i.e. poll taxes, literacy tests, and currently existing laws that strip one’s right to vote for life if convicted of a felony). Law enforcement officials unevenly also enforced laws, imprisoning a disproportionate number of African-Americans, where their labor was once again sold at little or no cost. For more information, see The Strange Career of Jim Crow (link provided above) and Slavery by Another Name. I say this as an African-American and the descendant of Africans and Europeans.